Our newest app! Enjoy the best of our music for meditation, relaxation, yoga. At last -- we have compiled the best of Richard's music in our latest app -- Music Oasis for Meditation, Relaxation, Yoga. If you enjoy the music in the background of our guided meditations, then you will love this app. It gives you the ability to listen to a piece for any length of time with a Timer feature. 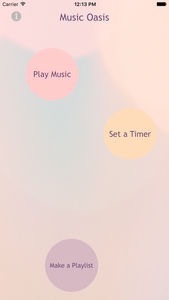 A Playlist feature allows you to create your own playlist, as well as including some preset playlists. You can also choose from 5 nature sounds to mix with the music if you like. Enjoy this uplifting instrumental music whenever you need calming, relaxation or soothing. Needless to say, I am a great fan of Richard's music. As a long time practitioner and teacher of meditation, his music is imbued the very essence of the meditative experience and helps others to experience it. We have already received some inspiring feedback: "This is a beautiful app with wonderful music!" The app is available in the Apple app store.